A unique view of Morden just before it was overwhelmed by suburbia. Every property, including building plots, is listed, with details of owner, occupier, leases and rents. Many properties have full descriptions, some with plans. The original maps are missing but Rosemary has reconstructed them and plotted each property onto the 1912 OS map. to mains services, the house price might increase because the site had become more attractive. It did not take into account improvements made by the owner of the property. the valuations and these were completed as far as possible by 1915. Lloyd George, who was Prime Minster at that time, refused to have his property assessed. London Region IR121 and then under Merton. plotted onto maps which were drawn specifically for the purpose. old and had been listed in the 1838 tithe apportionments. relate to type i.e. land, public buildings, etc. as far as Bishopsford /Sutton Road and up as far as St Lawrence’s Church. routes of roads for the St Helier Estate. Not all the valuation numbers appear on both. so the valuations may have been used to calculate the purchase price of the land. survive they will be in local record offices which in our case would be Surrey History Centre. 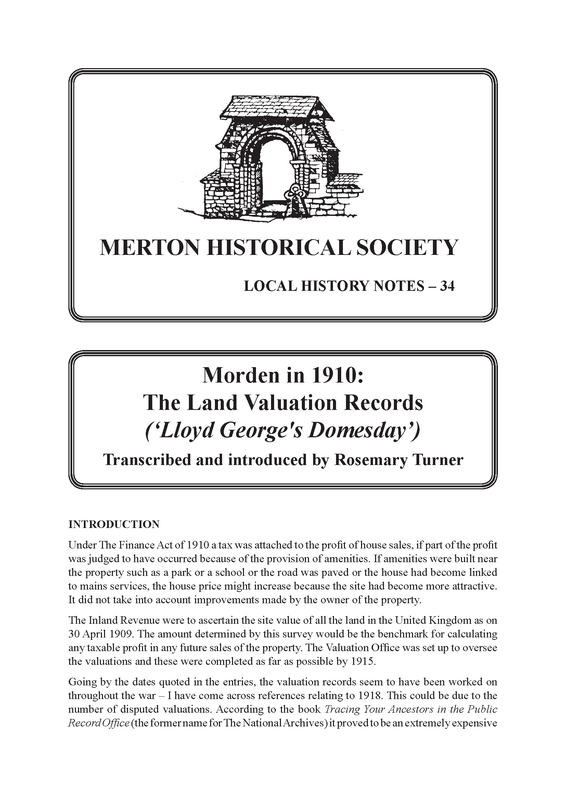 Morden was very small in comparison with Mitcham with 7797 entries and Merton with 3,900.
in by different people, so the wording and information vary. the property – a cottage may be occupied by an employee of the person renting. with the property. These names and addresses where given have been included in this publication. dotted lines. This was the only plan marked in this way. plots a stamp saying ‘Void’ has sometimes been used. noted in the description. Addresses of the Owners, where given, have been listed separately. often give the date at which it started. plans have been plotted onto a 1912 OS map. often itemised i.e. land, buildings, timber, etc. some cases also give the 1838 tithe apportionment numbers. dilapidated or poorly built and a considerable amount of the land was prone to becoming very wet. can be very complicated, often referring to one or more other entries. they could now appear in family papers. amount as it appears in the field books. originally held there. Wimbledon was registered at Clapham. the Morden entries than in those for Croydon, Carshalton and Streatham. been left as in the entries but in the indexes slight alterations have been made to assist indexing. living there, their occupations and from where they originated. roughcast and pantiled. No.111 was unoccupied. Both properties were owned by G Hatfeild. search of birth, marriage and death registration entries. publishing and produced the maps for me to work on; and the MHS editorial sub-committee. Semi-detached. House, shop, bakehouse, stabling & meadow. stable 2 stalls & loft. Cart shed & shed, meadow, garden. House, bakehouse & stabling built of brick & slate roofs. Land fronting Sutton Road 250ft deep to be valued separately see form 4. A partly enclosed area of meadow land fronting Sutton Road about 630ft frontage and an area of 3ac 2r. See Ravensbury Park Estate opposite which is more desirable. There is a public footpath adjoining this land. gardens. Handsome Kentish rag & Portland wall gate pillars Iron gates 3 pairs. 3 span greenhouse. Brick & pan tile 3 bay cart lodge 2 bay ditto & mess rm. Old timber slate 4 bay cart lodge. Old timber & felt 2 stalls & fodder rm. Chapel:- Church of England, Inside Bath stone & plaster, pitch pine roof small vestry. Chapel Non Conformist ditto. Bell room in tower, 2 cart way. Ladies waiting rm & WC. Mens do. in parts. Timber & slate gardeners tool house & mess rm. Note:- 2552 graves sold up to 30.4.1909 about 2¼acres. except 100yds from east & west cottages & cottages in Grand Drive. Detached house – built of timber plain & pan tile roof. 1st floor:- 3 bedrooms. Grd floor:- 2 sitting rms, scullery, washhouse. cow stall. Ditto (3), Stable & calving pen, 3 pig pens. Yard & small paddocks & garden. Ground floor of house 1 step down. Detached farm house built of brick part timber with slate. Plain & pan tile roof. house. Timber slate granary. 3 stall nag stable, calving pen, 2 open ditto. Timber & tile 5 stall stable loft above. cows. Timber & pan tile 6 bay cart lodge. Pleasure & kitchen gardens. Gardens yard, rick yard & 2 paddocks. Amended valuation 8.7.1912 Footpaths as per ordnance sheets also drainage from adj property. adjoining two let with Lower Morden Farm. earth track from Lower Morden Lane. 21.10.1912 derelict. Fowl house & dairy. Old timber slated cottage, 3 beds, ground floor:- 3 rms. Galvd iron single Motor House. Most of the land used for gardening purposes. Let to James Youngs “Ravenshoe” Pollard Rd £1. Pollard Road is a private Road. Grd floor:- 3 Sitting rms, small kitchen wash house pantry coals small conservatory garden. Built of brick coloured, slate roof. About 4 acres of market garden land let to C Sayers at £20 per an in the occupation of John Sticklings. Approached at present from Wandle Road over Mr Sayer’s land. Road also about 11ac of temporary pasture land together making 52ac 3rd 37p occupier John Elmers. There is an old timber & Galvd iron shed on Sayer’s letting. rms 1 small & 1 large conservatory. Servants hall kitchen 4 WCs domestic offices cellar 2 staircases. Detached – Misses Elizabeth Emily & Ethel Emily Baker. shed bowling lawn & large garden. fronted tiled roof attractive decoration. Detached house double fronted. Built of red brick & tiled roof not well built. Settlements which are still moving. a depth of about 325′. The land is out of cultivation & no pasture growing. Fairly level with road. rusted out. Part being used for pig pens. 63 fruit trees small. Old brick making machinery on land but no value & antiquated other buildings being pulled down. land slopes down away from road to Brook used in conjunction with brickyard. To be valued as requested. James & Charles Trendall occupy a pair of cottages known as Clifton & Flitwick Cottages. living rm over. Timber fodder rm potting shed wood shed. The grounds are well wooded and laid out as pleasure & kitchen gardens the boundary includes half the stream. Five enclosures of water meadows, one enclosure of garden ground say about . ac and about . pond reeds and rough land. Included in ace [acreage] is half the river Wandle. Nearly the whole of the meadows are 2 to 4 ft below level of water in stream & mostly water logged. The public footpath upon South Western boundary is included in area. There are no trout in stream and water no doubt too impure at time for trout to live. & tiled barn (now racket court) Cow stall & large open shed. Now let to Capt Edward Lonqueville. Modern brick built & tiled stable 2 stalls loose box harness rm & bedroom on pt floor. Second floor:- 2 attics box rm & large attic 22.2 x 19.9, First floor:- Bed rm 20 x 22.8 three beds bath & WC. Old timber & Galvd iron roofed single coachhouse bad order. Timber & felt roofed fowl run. Large gardens bad order as house has been empty for 5 to 6 years from 11.4.1912. House requires redecoratingthroughout. Settlements Tower being underpinned 3′ 9″ of concrete being put in. House orchard & veg garden. The market garden Garth Rd. is wet and the trees mostly blue plum are young but unhealthy in bad heart condition. & Galvd iron roofed 2 bay cart shed. Semi detached – 1st floor:- 3 beds, Ground:- Private bar public bar tap rm beer cellar kitchen scullery WC. an entrance to stable over right of way. Detached – Double fronted. Brick part cemented slate roof . 1st floor:- 5 bedrooms dressing rm bath & WC. Grd floor:- Hall 3 sitting rms 2 connecting by folding doors. Servants hall small kitchen. Large cellars. Conservatory. Semi detached but only attached at stabling & rooms over. 1st floor:- 5 beds. Grd floor:- 2 sitting rms kitchen scullery. Dairy WC. WC front garden. Galvd iron fodder store. Timber & pan tile 4 bay cart lodge. 1 calving pen. The portion in Mr R W Seward’s occupation is the kitchen garden. in Lower Morden Lane & sewer & gas in London Rd. Two public footpaths intersect this land. Detached farm house. Built of timber & pan tile roof. 1st floor:- 2 beds. Grd floor:- living rm, store rm scullery. Timber & Galvd iron shed. 3 old timber pig styes. Note – 6 brick pig styes & fodder pens built about June 1910. Detached stabling 1 stall coach house fair gardens 1 oak & 3 elms. House built of yeo stocks red brick dressings & tiled roof also stable. 1st floor:- 5 beds bath & WC. Grd floor:- 3 recept rms rather small. Kitchen scullery pantry WC coals etc. Detached stabling single coachhouse & 1 stall. Semi detached and occupied by his farm labourer. 1st floor:- 3 bedroom (1 small) tank room. Grd floor:- Living rm & scullery. Outside – sideway front & back gardens WC & coal house. Built of yeo stocks, rough cast above patent tile roof. Farm buildings comprising 2 fodder stores and 7 bay cart lodge. Constructed of yeo stocks Galvd iron roof. rather poor & wet. The portion of Grand Drive fronting this land is in very bad order. There is a public footpath upon…..
houses; Timber and pan tile calf pen 6 cow stalls loft over. Cart shed 6 cow stalls loft over. 2 old calving pens. Timber & plain tile granary; Timber & pan tile 6 stall cow stall 4 calving pens. 3 cow stalls 2 open cow stalls. London Rd and 2 pasture & one temporary pasture fields also wood known as Cherry wood. The land is fertile a little heavy and wet at times. The New Rd has gullies & water laid on to part. There is a public footpath close to a fence. There are two public footpaths across this land. land is rather wet at times. Three enclosures of undulating meadow land. Stiff soil which at times is rather wet but productive. There is a frontage to Central Rd and Morden Road. The latter has a main watercourse upon boundary of road. Roof 3 bay open shed. 1st floor:- 8 beds sitting rm bath & WC. Grd floor:- 5 recept rms hall domestic offices. Brick & slate diary [sic]. Greenhouses – Range of new greenhouses ditto with 4 divisions garden frames land. 1st floor:- 2 beds. Grd floor:- 2 sitting rms scullery laundry ironing rm WC. Large garden & drying ground. There is a public footpath across one meadow & one arable field. London Rd which is 4′ to 6′ below London Rd. The temporary building lately used as a laundry are claimed as tenants. to front room executed since Xmas 1911. Garth Rd is private not in good order with sewer & water mains. Small garden & terrace house. The rent includes an extra piece of garden not included in this valuation. Let with cotts see 75 to 88. An unenclosed area of land for allotments Garth Rd about 670ft frontage. Road at this part is not top metalled nor in good condition. Garth Road has sewer. Terrace House – Built of brick red brick dressings slated roof. 1st floor:- 2 beds. Grd floor:- Sitting rm kitchen scullery WC. Front & back gardens back entrance. Fences want repairing & painting wanted 9.2.1912. Party walls are carried through roofs at every 2nd house. Built of brick & slate roof. An enclosure of vacant building land used as allotments situated between dining rooms & bakers shop. parlour store cupboard private entrance, kitchen scullery WC. Old greenhouse, 2 stall stable cart shed & store. House & stables built of brick slate roofs. House not well built stables badly built. Built of brick & slate roof not well built. Built of red brick hanging tiles & ornamental tile roof. In fair order except roof of scullery which is too flat. Tenant pays water rate. Greenhouse & sheds tenants. cricket pavilion at end of garden. Terrace house – no entrance lobby. The amount of garden used is not definitely defined. Built of yeo stocks tiled roofs, back addition built of timber rough cast & pantile. 1st floor:- 2 beds, Grd floor:- Sitting rm kitchen & scullery WC. Large garden. Built of brick & pan tile roof fairly good order. This house has same number of rooms as No 1 but with large wood shed extra and rooms rather larger. Semi detached – This house has a side entrance & rather larger garden. washhouse WC. Front & back gardens. Built of brick pan tile roof , verandah in front. The timber & tile laundry is claimed by tenant. This house has only 1 sitting rm. Built of yeo stocks & slated roofs. Modern built & attractive red brick & rough cast elevations tiled roof. Built of timber rough cast & pan tile roof. Structure very old & inconvenient. Detached Cottage – One storey – 2 beds living rm washhouse WC & garden. Built of brick timber & slate roof. Drains connected with sewer. This cottage is approached from Central Road by private roadway. This cottage has rather more timber construction than brickwork but nearer main road & more garden. Semi detached – Let as Morden club Secy H Robins, Crown Rd. House built of red brick & slate roof, part of club room built of timber and Galvd iron. Let upon yearly tenancy at 1/- per ann paid in advance. No intoxicating liquor sold. Semi detached – First floor:- 3 beds (one not separate), Grd:- Sitting rm kitchen scullery. Semi detached – 1st floor:- 3 beds (one small) Grd:- Sitting rm kitchen scullery (no entrance passage) WC. Built of brick slate roof. Built of brick slated roof. Stanley Road has granite kerb footpath paved etc. & dining rms study hall domestic offices, basement:- store rm wine cellars etc. House built of brick part cement faced & slated roof not well arranged. Earth closets throughout sinks [or soils?] etc taken into cesspool then into sewer. room loft & store above part. Detached stabling comprising harness rm coach house 2 stalls gardeners stores with 2 bedrooms & loft above. Washhouse 2 stall cow stall timber donkey stable garden paddock lawn 37 elm trees 45ft 1 walnut 4ft. Cottage school house built of stocks & tiled roof. First floor:- 3 beds 1 of which is small, Grd floor:- 2 sitting rms kitchen. Outside:- coals & WC small garden. Tenant pays 7/6 week inclusive. Parish Hall – Built of brick part old building part cement faced & tiled roof. Comprising – large hall side hall divided by rolling shutters & class room. 2 cloak rooms lavatory stoke hole. Detached House built of brick cement faced & painted & slate roof. 2 WCs servants hall butlers bedroom kitchen scullery dairy etc. 2 separate cellars. coach houses loft small yard old greenhouses gardeners stores. Farmery comprising yard timber & slate 7 bay open oxstall. Brick & tile 13 stall closed ditto & fodder rm. Timber & Galvd iron 5 bay open oxstall & bull shed. Lawn pleasure & kitchen gardens walled in. Right of way over roadway to land & cottages. Built of brick slated roof. Comparatively upon road boundary. of stabling is claimed as a tenants fixture. Grd floor:- 3 large reception rooms & library, hall. Basement, half:- servants hall kitchen domestic offices. Outside:- Dairy coal cellar portico 2 greenhouses brick & slate stabling 2 single coachhouses 4 stall stable. sitting rm small kitchen washhouse. House built of brick cement faced painted slate roof. Mansion is of plain construction, red brick slate roof stone dressing painted. floor:- 3 reception rooms not large, hall marble floor, usual domestic offices & fair cellars see notebook19 page. laundry store room brew house double coach house apple rm above & leanto coach house. 2 fairly new brick isolation boxes & yards greenhouse gardens stores. WC & small wash house occupied by cowman. Greenhouses:- One range of 3 –two detached ditto 4 garden frames gardeners stores timber & Galvd iron shed. as no doubt tenants fixture. Built of brick stone & red brick dressing slate roof. 2nd floor:- one large attic, 1st floor:- 3 beds bath & WC, Grd floor:- 2 small reception rooms kitchen scullery. pleasure & kitchen gardens plantation 2 meadows & allotment garden ground. There is a roadway formed with gullies from Crown Lane to shed. table drawing rm conservatory dining rm breakfast rm kitchen scullery large domestic offices. Built of brick cement faced & slate roofed. Stabling 3 loose boxes harness rm loft. Timber & Galvd iron 2 gardeners stores potting shed 3 greenhouses. House built of brick timber & cement panels above tiled roof. The house is not particularly well built. Brick & tiled stable 2 stalls loose box large loft over coach house woodshed WC greenhouse garden frames. Grd Floor:- Large shop, Private entrance Sitting Rm Kitchen & S.
Fairly well built yeo stocks red brick dressings slate roof. felt 4 pen piggeries & cart shed. Conservatory garden in a rough state. Outside: Garage. Timber & Galvd Iron workshop. 2 stall cowshed & sheds 2 greenhouses. Note:- The moveable fowl houses not included in valuation. Built of brick red brick dressings slate roof. 1st floor:- 3 Beds under one roof no back addition Grd floor:- Sitting Rm Kitchen Scullery WC. Detached House Fairly well built of Yeo Stocks red brick dressings & slate roof. stable loose box & 3 stall cowpen Timber felt & pantile cooking house & shed. Timber & Galvd Iron Store. outside WC small washhouse garage Pony stable Coals greenhouse Lawn Kitchen Gardens Old chicken runs. 1st floor:- 4 Beds Bath & WC Grd floor:- Hall 2 sitting Rms Kitchen Scullery WC. Large garden. In the rear of Soudeley Mitcham & Meadowside. The land is fairly level & contains portion of pond. The land fall slightly slightly away from Road. See 169 Temporary Building in Recreation Ground for Village Meetings. Temporary timber & Galvd iron building outside measurements 30′ x 16′ no provision for fireplace. & not very suitable for Building purposes. liable to floods from Pyle Brook. The same is low lying and generally wet Large pond. 20 fruit trees. Tenants sheds. Pleasure & Kitchen gardens. Four enclosures of meadow and rough pasture land and about 3¾ acres of coppice. The Land is rather heavy clay, wet at times more particular towards brook. Land purchased by Capt Harold Francis Bidder in 1910 at £1720? House built of Surrey stocks Red kiln brick dressings & tiled Rm. The Land is being laid out as Lawns & pleasure grounds by present owner. The land has since the 30.4.1909 been fenced in. It falls away from the Road. An unenclosed plot of Building Land 80 x 137′ having a frontage of 80′ to the northside of Wandle Road. western side. The land is fairly level with Road. An unenclosed plot of Building Land with frontage of 50ft to Morton Road depth about 150′. A partly enclosed parcel of Building Land upon the north eastern side of Seddon Road. Church with plain oak pulpit, oak pews, carved stone font plaster ceiling with oak & chestnut beams. Pollard Rd 100 to Seddon Rd to include strip 10ft reserved for back entrance see letter 26.11.1912. The Land is rather uneven and above Sutton & Pollard Roads. Pollard Road is a private Road. in rear of No 1 Crown Road. Apartly enclosed area of building Land 160ft x 200 & 30 in rear situated at Corner of Sutton & Wandle Road. The Land is about 3ft below Sutton Road. Some handsome Beech trees upon this plot. A partly enclosed area of Building Land 70′ x 200ft x 65ft at rear having a frontage to Sutton Road. An unenclosed parcel of Building Land upon the Southern side of Wandle Road 80’x 150′. side frontage to a proposed Road. Land is fairly level with Road. A partly enclosed area of building Land fronting Wandle Road 100ft c 221′ x 40 in rear. The Land is slightly below Road. is being used upon 21.10.1912 as pleasure ground in connection with House Ravensbury Manor. water level and below surface of Road. Unoccupied. Includes 5ft strip upon Northern Bank. This entry was posted in Publications, Local History Notes and tagged in 20-century Morden, lhn, morden, tithe, transcript.